Venus and Saturn setting on the evening of Friday, June 29. Click image to enlarge it, Regulus is the brightish star above the pair near the top of the image. The dance of the planets climaxes tonight and tomorrow night (June 30th, July 1st) when Venus and Saturn are at their closest. Of course, most of southern Australia and the eastern seaboard are under cloud, or being flooded, or just recovering from floods, so viewing this event may not be easy. Still, do make an effort, this is a fairly rare and attractive event. The best times to look are between 6:00 pm and 8:00 pm (your local time), Venus will be very easy to recognise, being the brightest object in the north -west sky, Saturn will be the dimmer object only about a fingerwidth away. In a small telescope you can see both Saturn and Venus together in a lowpower objective. This will be very nice. Also, tonight (Saturday June 30th) is a Blue Moon. Over at Dynamics of Cats Steinn Sigurðsson has been blogging the Extreme Solar System conference (Heck, he was one of the organisers). Lots of good Extrasolar info there for us exoplanet junkies, not the least the annoucnement of a genuine Jupiter analog. Centuari Dreams has some good commentary on Stienn's postings, so pop over there as well. The ninth Carnival of Space is now up! The ninth Carnival of Space is now up at the Planetary Society blog. Mostly about spaceflight this week, although I get to muse of extrasolar atmospheres. SO put on your space helmet and rocket over. ...in the ABC's recently revised editorial policies, a priority is placed in allowing principal relevant viewpoints on matters of public importance to be aired. We want the ABC to be Australia's town square where people can debate, hear alternative views and learn from each other. It was in that spirit that ABC television made the decision to purchase the year's most contentious documentary, The Great Global Warming Swindle, written and directed by British producer Martin Durkin. Sorry Kim, the sad fact is that the alleged documentary is not a contribution to a debate, but complete rubbish. It gets the basic facts of climate change wrong, it ergeriously quotes the lone climate scientist out of context (the majority of its so called climate experts are nothing of the sort), and it uses, to not put too fine a point on it, made up data* to make it appear as if climate hasn't changed (and their graph of solar activity vs temperatures is a little, shall we say, imaginative and shows a spurious correlation due to arithmetical errors). And its not like these basic flaws weren't well known when Aunty purchased this piece of fiction. What's next Aunty? "The Great Heliocentric Swindle" complete with faked data showing the Sun orbiting the Earth? UPDATE: To be fair to the actual Science Unit of Aunty, the TV management ignored the advice of the Robin Williams of the Science Unit, whom I have the greatest resect for. *Yeah, there could have been an honest mistake where the vertical scale was exagerated, and 1988 was removed from the graph and replaced with 2000, without adding in the data to 2000 (see this image here comparing their graph to the real data) and then this mindboggling bit of incompetence had to be missed during the fact checking and post production of the show. This graph was a key part of their "argument", and if they can't get that basic fact right, with all the publically available data out their, it speaks volumes about the "accuracy" of the rest of the show. What will etxrasolar planetary atmospheres be like? Over at Centauri Dreams, there is a very nice post on modelling exoplanetary atmospheres. It is pointed out that, as you move further away from the sun, the more water planets have. As well, the formation history of the planet plays a role. The small rocky planets Venus, Earth and Mars lost most of their original atmosphere when during the initial accretion phase, when rocky plantessimals slammed into the growing planets. Their subsequent atmospheres are a result of outgassing of volatile material from the accumulated rocky material and incoming comets, and weathering reactions between the atmosphere and the planet. The giant outer planets have atmospheres very similar to the composition of the primordial solar nebula, as the larger mass worlds could hold onto more of the primordial atmosphere. For exoplanets, we expect similar relationships to hold. Large, Jovian style worlds should have atmospheres very similar to Jupiter or Saturn for example. However, in many extrasolar systems the worlds have migrated inwards to much hotter regions, so their atmospheres will probably have evolved to some degree from that of Jupiter. Hot super Jupiters like HD 149026b are very dark, as dark as charcoal, suggesting their atmosphers are no longer Jupiter standard . To give an idea of how this may affect a world, lets take the super-earth Gliese 58 c. Just to refresh your memory, Gliese 581 C is a 1.5 Earth radii planet that was originally thought to be in the habitable zone of its host star, but outside the orbit of a "hot Jupiter" Gliese 581b. The history of Gliese 581c's formation will be critical to its atmospheric composition. If Gliese 581c was formed from the debris of a terrestrial-like world shattered when Gliese 581b migrated to its present star hugging location (see Mandell 2007), Gliese 581c would have lost most of its original atmosphere, and had to develop a new one from out gassing of volatiles in the rocks that formed it. So if Gliese 581c is a terrestrial world, then it could have a predominantly CO2 atmosphere. How dense is a good question, as we still don't have a clear idea of the original atmosphere s of Earth, Venus or Mars when they formed, anywhere between between 1 Bar and 20 Bars (where 1 Bar is the atmospheric pressure of current Earth, Venus is around roughly 90 Bar). More likely is that Gliese 581c formed further out beyond the “Snow line” where water ice forms in the protoplanetary disk, and migrated in to its current position (based on the observation of at last one other “Hot Neptune”). Then Gliese 581c atmosphere is probably going to be more like Neptune when it initially migrates to its current orbit. Neptune’s atmosphere is mostly hydrogen, helium and about 3% methane. With Gliese 581c d so close to its Sun, its atmosphere should evolve rapidly. The methane will be rapidly broken down and the hydrogen largely lost (although the hydrogen escape limit is higher for a larger mass world than earth, Gliese 581c is hotter). Gliese 581c will also have a lot of water in its composition, and will probably be covered in a global ocean, with little or no exposed land. As weathering reactions remove a lot of the carbon dioxide from Earths atmosphere, what the final atmospheric composition of a water world is not clear, but a high pressure atmosphere with at least a substantial concentration of CO2 is entirely plausible. Look at Titan, an ice world with a thick nitrogen atmosphere. So while we have a fairly good idea of what an exoplanetary atmosphere may be like, the evolution of these worlds atmospheres may be far from simple, and surprises may wait us when we finally get in a position to look at the m in some detail. The latest issue of the Meteor Contemporary Poetry Project is now available. wishing to be a real star. For the rest of the poems, and back issues, follow this link. More meteor poetry is at Astropoetica and Cosmopoetry. Saturday 30 June is a Blue Moon here in Australia, along with Europe, Africa, Asia. Folks in the Americas saw the Blue Moon in May, and folks in New Zealand have to wait until July. Here is a table of Blue Moon times, and have a look at this Blue Moon calculator. Blue Moons occur because of the mismatch between the Solar and Lunar cycles. Once in a Blue Moon also means a very rare event, but using the current definition of a Blue Moon as "the second full Moon in a Month", then once in a blue Moon is once every two and a half years. The full Moon won't look any different, but you will know that it is special (sometimes atmospheric dust can make the Moon look blue, this is another rare, but irregular event). If you want to sing the "Blue Moon" song on saturday night, here are the lyrics (along with a range of other Moon songs). Veuns an Saturn meet in the evening. Venus, Saturn and Regulus line up on Saturday evening at 6:00 pm ACST, click image to enlarge it and see the sickle of Leo. The almost final act of the Venus - Saturn hi-jinks occurs this week. Venus and Saturn rapidly draw closer, by Saturday 30 June and Sunday 1 July they will be less than a fingewidth apart. If you have a small telescope, you can see the ringed world and the crescent Venus in the same low power eyepiece field. Venus is the exceedingly obvious very bright planet above the north-western horizon. The best time to observe is between 5:45 and 7:30 pm. This will be very attractive to watch over the coming nights. One of the up sides of the rain *(which is making it hard to document the Venus Saturn encounter), is that we get a lot of rainbows. Here is a beauty that I saw from the kitchen window while making the kids breakfast. A couple of weeks ago, I saw a beauty in the city, a prefect, intense, double rainbow that was floating in front of the buildings. And I didn't have a camera (sigh). *despite all the rain, and the savage storms lashing the east coast, our resivours and rivers are still periolously dry. The 8th Carnival of Space is now up at Universe today. The puddles on Mars that weren't, Moon madness, a sense of wonder about the universe and a whole lot more. Go over there and see it all in its Spacey goodness. This charming image was taken by Tony Travaglia of Otago New Zealand (click to enlarge). The Moon is crisp and the clouds add a feeling of movement. For some more of Tonys pictures see here. Congratulation Rob McNaught, who was able to catch a hole in the cloud over most of eastern Australia and discover Comet 2007 M1 McNaught. I'll do a chart later. Via NewScientist, this is an MP3 file that lets you hear Deep Purple's "Smoke on the Water" as if played on Titan and Venus. That's assuming you could find instruments and a band that could survive crushingly dense superhot sulfuric acid atmospheres (or astoundingly frigid ones). The first clips is as it sounds on Earth, then on Titan, the sound is deep and rich and finally on Venus, despite being hot and heavy, the sound is surprisingly thin and tinny (but try increasing the volume). The combination of low temperature and slightly higher pressure on Titan means that sound is transmitted more efficiently. For the full paper explaining the atmospheric effects on sound, go here. 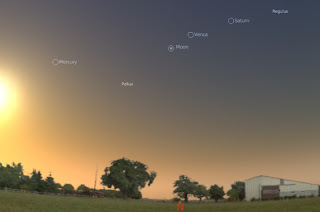 Venus, Saturn, the Moon and Regulus line up in the evening sky on Tuesday 19 June . Again, you will need to click on the image and enlarge it to see them properly, as well as the Sickle of Leo. Tonight, with Saturn just above the Moon, was especially beautiful. I got out the 4" scope and had a look. Ringed Saturn floating above the craters of the Moon was very nice indeed. Tomorrow, The Moon is near Regulus, andother attractive lineup, well worth a look. Venus in the daytime. You need to click the image to enlarge it to see Venus. Yep, this is the real deal. Taken 15 minutes before sunset, no clouds hiding the Sun, which was visible through the trees when I moved around setting up the shot. Unlike yesterdays image, which was on the threshold of sunset. Several of my colleagues were leaving for home and wandered up to see why I was taking photos of empty sky. So I held an impromptu "footpath astronomy" session and I pointed out Venus to them and explaine dthe significance of this. Most people were impressed that they could see a planet in daylight. I also went out at around 3;00 pm as well, after a few minutes looking in the wrong spot, I realised Venus was higher and spotted it instantly. I'm getting my eye back in for Venus in the daytime (I used to be very good at spotting it, but this year has been very hard to pick it out). Over at SpaceWeather, they have a gallery of images from the occultation of Venus, take a look. The live webcam for the daylight occultation of Venus is here. Venus goes behind the Moon at 11:58 pm AEDST (about now ACST) and reappears around 12:58 am AEDST. (Just watched the disappearance, but the image is captioned "simulation", but it looked real, so I don't know if it really was a simulation). Venus in the daytime, just. This image was taken about 2 minutes before Sunset, with the Sun behind a heavy bank of cloud. So it just squeaks in as "daylight". Venus is the dot near the top right hand corner (click to enlarge). Today alternated between fantastic blue sky and pouring rain. Of course, we would have a fire alarm-induced evacuation just when it was pouring hardest as well (and me without my raincoat). About 3:00 pm it was clear again. I walked around the main building so that I could have a clear view north, but with the Sun blocked by the main building. Withing a few moments I could see the Moon, and then Venus was visible, clear as a bell. It was also close to the car park building, so I had a handy referent. I took a couple of pictures, but you really can't see anything in them, even the moon is a pale blur. I went back to get the students, but it started raining again. Later, it did clear up and I was able to show them Venus, and they thought that was cool. I managed to get some shots on the way home (the above image for example), then the rain closed in again. So I was alseep instead. Stuart has a twitter page with all the action from last nights Moon Bounce though. Remember Eris? The icy worldlet that was bigger than Pluto? The one, that when it was proposed that it become the 10th planet an astronomical brouhaha resulted with Pluto demoted to being a Dwarf Planet? Well, it now turns out that Eris is heavier than Pluto as well. 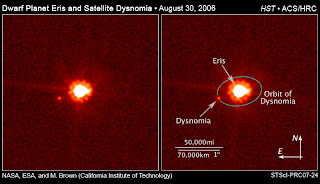 By observing the orbit of Eris's moon Dysnomia, Mike Brown and his team were able to determine the mass of Eris. It turns out to be around 27% heavier, than Pluto, which suggests that Eris and Pluto are of similar composition, mostly ice with some rock thrown in. 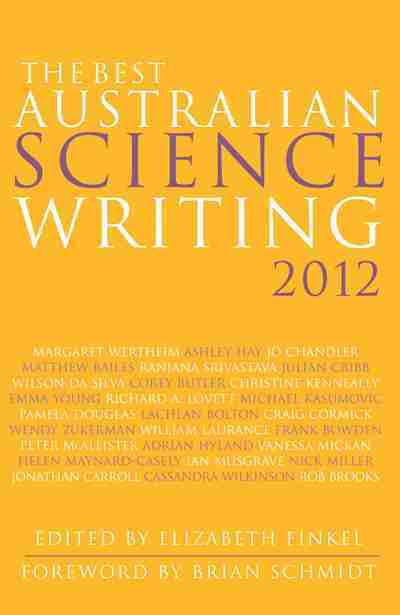 You can read more about this at Science, Nature, New Scientist, ABC science Online and Centauri Dreams. Poetry to the Moon and Back. Stuart has just had his voice (or the electronic represenation thereof) bounced off the Moon. This is in preparation for poetry competition where the poems will be bounced off the Moon by the Jodrel Bank telescope. It's on today (late evening for us southern hemispherians), but I wish I could listen in. Venus is currently bright enough to see in the daylight. However, as it is a tiny dot in the vast expanse of sky, finding it can be difficult. If the Moon is nearby, you can use it as your guide to find Venus. On Monday 18 June the 12% illuminated thin crescent Moon will be just a handspan from Venus. So to find Venus, first locate the Moon, then look a handspan to the right and slightly up form the Moon. The Moon itself will be relatively difficult to see unaided, but at 3:00 pm on Monday it will be almost due north and between 5 to 6 handspans above the northern horizon (see the diagram above). 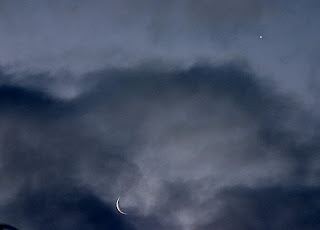 Once you find the Moon, Venus will be very easy to find nearby. You can of course view at other times, but the 3:00 pm time gives a better guide to the Moon. As this is a daytime observation be VERY careful of the Sun, do NOT look directly at the Sun. It is 7 handspans away from the Moon, but care is still needed. Make sure a building, wall or tree is blocking out the Sun before attempting viewing. 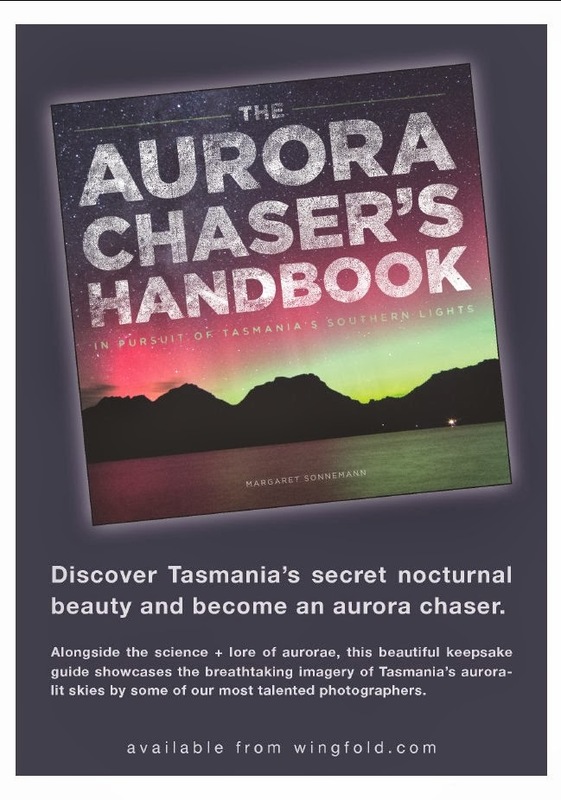 This improves safety, and improves your ability to see Venus and the Moon as well. If using binoculars ALWAYS make sure you are pointing them a away from the Sun, exercise extreme caution, as you can lose your eyesight if you accidentally look at the Sun through binoculars. In other parts of the world they will see a daytime occulation of Venus, there will be an attempt to webcast this event (tip of the hat to daveP). More details at the Society for Popular Astronomy. North western sky at 6:15 pm ACST. Click on the image to enlarge it. Over the next week we will have something to keep us entertained in the evenings. A dance of the planets with Venus and Saturn. Venus can be readily seen as the startlingly bright object in the northwestern evening sky between sunset and around 8:00 pm. Venus is in a line with Saturn and Regulus, the brightest star in Leo, which are also in the north-western sky above Venus. Venus draws closer to Saturn over the week. 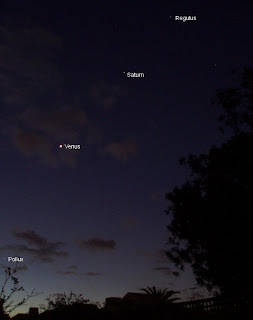 By Sunday the 17th, Venus, Saturn and Regulus are equidistant. On the 19th-21st the crescent Moon joins the line-up, sitting just below Saturn on Wednesday the 20th. This will be a very attractive sight in the evening, and well worth a bit of astrophotography. The final analysis of the Globe at night project is in. Globe at Night is the world wide project to determine the extent of light pollution, some of you may have contributed to the survey, so pop on over and have a look, you can compare the 2006 to the 2007 data as well. The 7th Carnival of Space is now up at Star Stryder. Solar Power from space, musings on extraterrestrial life, Space garbage disposal, holes in Mars (and my own musings on Gliese 581c) and a whole lot more, pop over now! So is Gliese 581 c really a Venus like inferno? Remember Gliese 581c, the 1.5 Earth radii, 5 Earth mass planet that caused so much excitement? It was reported to orbit within the red dwarf Gliese 581’s Habitable Zone, making it the most Earth-like world yet found. The Habitable Zone of a star can be broadly defined as the zone where liquid water could exist on the surface of a planet. There is a lot more to habitability than just liquid water, but bear with me for a moment. In the original Udrey paper, it was reported that, based on its orbit, the temperature of Gliese 581c could range between -8ºC if it had an albedo like Venus to +40ºC if it had an albedo like Earth, with a median of around +20ºC. However, what may people overlooked (probably because it wasn’t in an earlier version of the paper) was this statement. The greenhouse effect is particularly important. Earth has an average surface temperature of +13ºC (ranging from arctic wastes to tropical forests), but if not for the greenhouse effect of Earths atmosphere we would have an average temperature of -18 ºC. Decidedly unfriendly. Now a group has done detailed calculations of the greenhouse effect for Gliese 581c and 581d (the 7.7 Earth mass planet further out). The international team of physicists, headed by Werner von Bloh of the Potsdam Institute for Climate Impact Research in Potsdam, Germany, found that with realistic levels of carbon dioxide in a number of different simulations, where they varied the ratio of ocean to continental mass from that of a rocky world to a water world, Gliese 581c came out as a hellish, Venus-like world (the paper is here). This is not entirely surprising, even in the original Udrey paper, if Gliese 581c had an Earth-like albedo, reflecting 35% of the suns light back, its average temperature would be around +40ºC, not exactly comfortable. In terms of the luminosity of Gliese 581, which is 100 fold lower than Sol, Gliese 581c orbits in a location that is equivalent to being inside Venus’s orbit in our solar system. However, when Bloh's team ran the simulations on Gliese 581d, the planet that orbits further out, they found that it was in the Habitable Zone. Gliese 581d is a larger world, and is also likely to be a water world. In the majority of the simulations the group ran Gliese 581d had liquid water and a reasonable temperature. Now, when I say “realistic” CO2 atmosphere, they ran simulations with 5 and 10 bar of CO2 in the atmosphere. For comparison, Earth’s total atmospheric pressure is 1 bar, if Earth had a 10 Bar CO2 atmosphere, our surface temperature would be around 100ºC. How likely is it that Gliese 581d has a high pressure CO2 atmosphere. Being much larger than Earth, it would very likely have a lot more atmosphere. Since it is likely that Gliese 581d is a world that formed further out and migrated in to its current position, its atmosphere is probably going to be more like Neptune (at least when it starts out), which is mostly hydrogen, helium and about 3% methane. Methane is a more powerful greenhouse gas than carbon dioxide, but with Gliese 581d so close to its Sun, the methane will have probably broken down and they hydrogen largely lost. So over pressure CO2 atmospheres may not be entirely plausible for this world. Then again, there is Titan, with a thick nitrogen atmosphere, so post migration evolution of the Gleise 581d atmosphere may have enriched it with carbon dioxide. A thick atmosphere also makes it likely that even though Gliese 581d is tidally locked, the atmosphere will redistribute heat effectively, and the atmosphere not “freeze out” on the night side. So Gliese 581d is likely to be a water world, with a thick atmosphere of some sort, probably with titan-like hydrocarbon clouds as a source of organics at least early in its evolution. This makes it a possible candidate for the evolution of life (provided you don’t need an interaction between shallow seas and continental masses for life to evolve). Life on a water world with a dense atmosphere and rather high gravity would be somewhat challenged, and probably wouldn’t get more advanced than bacteria, but we can at least speculate that on this world, the global ocean might be teaming with ... something. The Gliese 581 system provides us with much food for thought, if the new generations of telescopes can detect the light from these worlds, who knows what we may find? Venus, Saturn, the Beehive, Regulus, Procyon and Sirius lines up above the western evening sky at around 6:30 pm (click to enlarge). Venus was on the edge of the Beehive cluster tonight, tomorrow night it is in the heart of the beehive. An attractive sight, but best viewed with binoculars. As well, while you are out looking at Venus in the Beehive, there is a farily broad but interesting line up of bright stars and planets. Sirius, Procyon and Venus are in roughly a straight line, forming the handle of the hockey stick. Up to the right, Saturn and Regulus form the blade. Okay so it's not the Pleiades, but it is an nice formation. Also, while looking at Venus, turn around 180 degress, se that bright object, that is Jupiter. 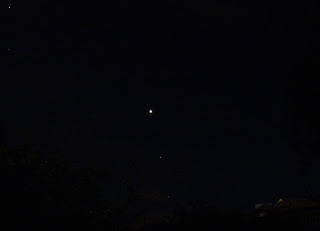 Jupiter and Venus are now alomst directly opposite each other, making the evening sky a very nice sight indeed. Just goes to show what happens when you aren't paying attention, back on Friday 8 June, about when we were heading for Naracoorte, a sun grazer comet headed in for a close pass to the Sun ... and didn't make it back out. There is an animation here (1 Mb). CometAl also has a nice composite image from SECCHI/STEREO in his gallery. We went to Naracoorte of the weekend, catching up with the Farm Cousins and Little Miss Just Walking. Being out in the country, I took along my small teslescope and camera to try and show the younglings Jupiter and Vesta, and see if I could get some decent dark sky shots of Vetsa. So of course it was couldy. First night out, I actually got to see an Iridium Flare through the clouds, pretty neat, but cloudy as all get out otherwise. Next night was clare while we were having tea, and playing table tennis with the younglings. It was clare as I set my telescope up. No sooner had I got Jupiter in my sights then "whoosh" cloud. Driving home the sky was clear, and we could see Venus beconing as we drove into Adelaide. Now, cloud. At least we did some caving and saw some fantastic fossils to make up for the cloud. And lost of bushwalking. Gave Gault has created an impressive video of the Lunar graze of ZC 1459. You can see this star winking out and in as it passes behind mountains and through valleys. The actual video footage was taken by observer Rodney, and Dave has added the soundtrack and done all the conversion stuff. Rodney's movie of the Lunar Graze of ZC 1459, with sound for the first 3 events. MovieMaker would not let me get the sound in sync exactly. However, the reported times we obtained are accurate for all events. 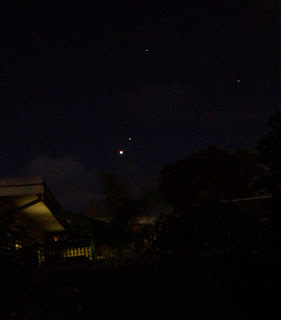 Venus and the Beehive, Vesta and Mars. The north-western evening sky at 6:30 pm, as seen from the southern hemisphere. Click to enlarge. Keep your eye on Venus over the next few days. Venus is now reasonably high in the evening sky, and visible after astronomical twilight. Between now nad August Venus will unbdergo a series of rather beautiful encounters, so its worth watching Venus for some time. 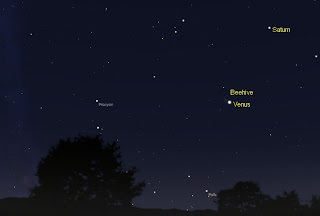 The first notable meeting is Venus and the Beehive cluster. This delicate little cluster lies in the heart of Cancer, the crab. 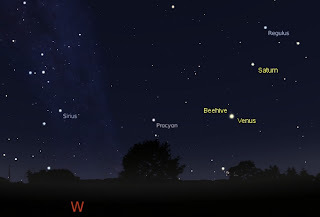 AT the moment, Venus is around a handspan from the Beehive, obver the next few days it will move closer, and between the 11th and 14th Venus will be in the same binocular field as the Beehive. The will be at their clsoest on the 13th, as shown in the image above. The beehive is dim, so you will probaly need binoculars to see this encounter at its best. Following this, Venus meets Saturn and Regulus so keep your eye on the bright planet. If you are up early in the morning on Monday June 11, Mars and the cresent Moon are close together. The asteroid Vesta is at magnitude 5.5, and can still be seen with the unaided eye in dark sky sites. A printable lcoation map is here. 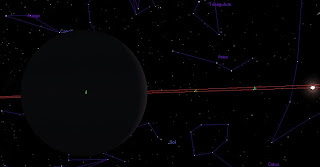 ... the AAVSO has issued a transit watch alert for Gliese 436. The AAVSO more traditionally watches for Nova or variable stars, but we are now in an era when amateurs can do stellar photometry so precisely that they can monitor extrasolar transits. Amateurs have been instrumental in confirming some recent professional transit observations. Have a look at Transit.org if you are interested in being a transit watcher. structure. That's the disappointing news. difficult for life to get a foothold," notes MOST Mission Scientist Dr. So, the results while disappointing in that we miss out on finding more about Gliese 581c (or d), but we know a lot of interesting information about the system. I'll blog some of my ideas about this later on. Centauri Dreams also has some good discussion of this report. It's ASMR Medical Research Week! What with work and all I forgot about ASMR Medical Research Week. It runs June 1-8, and there is lots going on. Here is a program of events. Here is the Media Information Pack. For us Adelaidians. there is a Science in the Cinema event on Thursday. The 1950's classic "Panic in the Streets". Too bad I have Kid duty that night. So, have a look and go to some of the events, you will enjoy it. June Southern Skywatch Now Up! Jupiter and Scorpius near the Zenith. 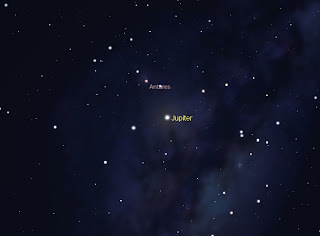 Jupiter is at opposition tommorow, Wednesday June 6th. And of course, the sky has been cloudy for days. Anyway, the June edition of Southern Skywatch is now out. Yes, its late, marking, end of semester guff, kiddy illnesses and all that. Sorry folks. As well as the opposition of Jupiter, there are more maps for unaided eye Vesta, Venus and Saturn dancing together, and a blue Moon. Since last writing, Sunspot 960 has let off two more serious flares (and a host of minor ones), including a powerful M7.4 flare. You can see the details of that flare here, and here is some of the STEREO imagery of that flare. It may be likely that Sunspot 960 will be visible with safe solar projection techniques. It is also becoming more likely, given its activity and the complex beta-gamma magnetic field, that Sunspot 960 could generate aurora. Presenting another in the series of Ian's famous blacks squares with indeciperable dots in it. You will have to click on the imnage and enlarge it to see Venus, Castor and Pollux (the twins, the brightest stars in Gemini). The weather here has been good for the fmares and dams, which means I have had virtually no chance to see anything. I got this shot of Venus and Gemini in between two bands of cloud and pouring rain. Heck the whole thing clouded over while I was taking the dark frame. But I still got to see it, and it was awesome. The last lecture has been given, the exam papers are proof read and at the printers. The colloquium abstracts are assembled and ready to be distributed. The teleconference is done, and I've sent my collaborator a bunch of gene alignments. Now I can relax and ... finsh Southern Skywatch, finish my Sky&Space contribution, coach my soccer team and set up the powerpoints for the Monday talks. Bed now. A Science Daily article alerted me to something I found quite amazing. We can map the surfaces of stars. Well, give that we can map the surfaces of exoplanets, maybe I shouldn't be surprised. However, the article reprots the ampping of the surface of Altair, a hot, rapidly rotating tstar that is the brightest star in the constellation of Aquilla the Eagle. You can read the abstract of the primary article here. Not surprsingly, as a fast rotator, Altair comes out as an elipsoid, rather than a sphere. Interestingly, it shows the phenomenon of "Gravity Darkening", where the gas of the stellar surface near the equator is cooler and less dense due to the rotational bulge. Other stars, such as Vega, Alderamin, and Betelgeuse have been mapped before (I didn't know that), but this is the first time a main sequence star has been mapped. The Sun just blasted out a M1.1 and C9.8 flare today. It's probably not from Sunspot group 958, the prominent group on the left hand side, but something sneaking up over the horizon (image courtesy of Space Weather). If the spot keeps up its activity, we might get some geomagnetic action, perhaps even an aurora. UPDATE: The Sun just let off two more M-class flares. Last time this happend though, the spot went quite soon as it moved into a position where it could produce aurora.